WHO ARE THESE FOLKS? WHO ARE THESE GREAT RACE CREWS? Company employee teams, crews of friends & relatives and throw-together-crews showcase a fascinating variety of folks from all walks of life: Engineers & flight attendants, finance & loan personnel, internet retailers & college students, hula dancers & hula teachers, plumbers & designers, travel agents & guitar pickers, parents & their adult children, adventurers & PTA mothers, grandparents & their adult grandchildren, friends & strangers, young folks & senior citizens, first-time-paddlers & returning paddlers, and you & me. All engaging in a favorite sport of the ancient Hawaiians. When the Start flag drops & the horn blares…12 paddles flash at once…water explodes & splashes… paddle whorls spin past both canoes…and for a little over 2 minutes nothing exists except your crew, the canoe and the exhilarating pounding in your breast. Both crews stroking for all they’re worth to cross that Finish line first. And one of you does. And then ya wanna do it all again. And you will! Park all the way down the road on the right. Unload & carry your stuff down the hill to the shore & set up. I’ll have big cooler full of water, but you may wish to bring your favorite drink & snack. Protection from the sun: Sunscreen, sunglasses, hat/visor. Our Bucket List Teams will have two canopies at race central…a place to rest & relax while you wait for your next race. Look for the Bucket List signage. Folding lawn chairs to sit under one of the canopies. Your cameras & smiles to capture the moment. Bucket List and Hoewa’a’s photos & video of the event will be on websites and Club Facebook page within a week after the event. The following general guidelines will help you understand rour seat assignments. SEAT 1: Stroker, maintains the best race pace the crew can paddle; your most consistent paddler. SEAT 2: Also a consistent paddler; must be able to paddle in perfect timing to SEAT 1. Half the crew cues on you, the other half on the stroker (seat 1). SEATS 3, 4, 5: Generally your power seats, your stronger & heavier/larger paddlers. SEAT 6: Hoewa’a provides the steersperson…a steersman for crews with 2 men/3 women…a steerswoman for crews with 2 women/3 men. Everyone in the crew paddle together, in synch, for the entire race. Repeat till you cross the finish line. 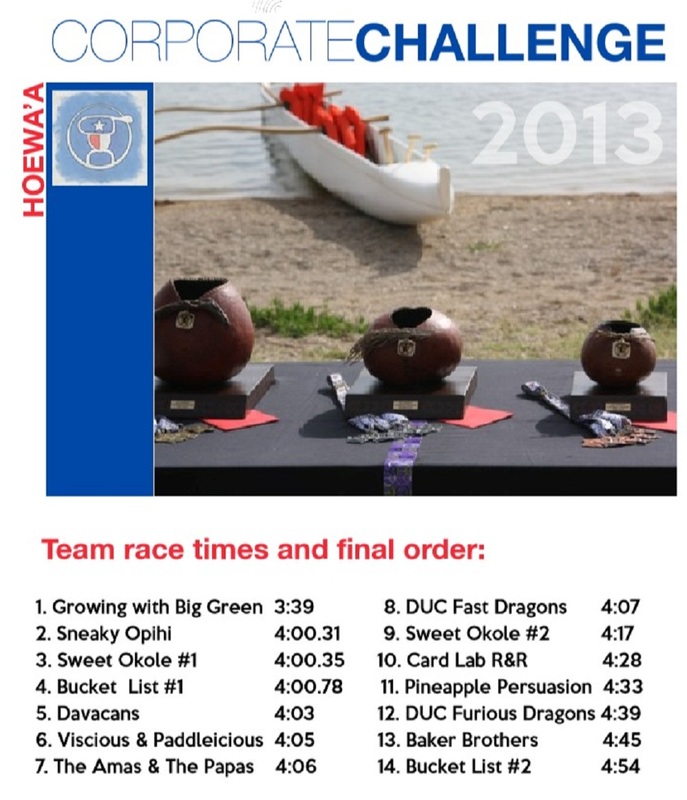 The top 3 Corporate Challenge crews will be presented with Hawaiian gourd art trophies called umeke (vessel, bowl). These traditional art pieces of contemporary design were lovingly designed & crafted by Hoewa’a club president, Manu Birkmeyer. In addition, each member of the Top 3 placing crews will receive medals. And all racing participants will receive a Corporate Challenge Certificate, a beautiful keepsake of this unique event. A special, late addition fun award is the ‘Pupule Paddlers’ Award for the most creative, colorful or crazy crew of the entire event. ‘Pupule’ means ‘crazy’ in Hawaiian…and most of us are! Best Little Outrigger Canoe Race in Texas? In 2010, Red Mango did it. In 2011, Kupuna owned it. In 2012, Ex-Cons claimed it. In 2013…..Come & take it! 9:15 Opening Ceremony – BE READY TO DO I KU MAU MAU! Malama pono a hui hou! 16. Bucket List I formerly known as Canoe on the Move – is captained by Donna with her son Matt in seat 4. Her trainer not committed yet is a candidate for the fifth seat. Son the Vietnamese powerhouse kayaker round up the group who want to be the first to move the canoe past the finish line. 17. Bucket List II– This group is composed of individuals from my social networking group Meetup.com. These are adventurous people who want to mark things off their bucket list and paddling Hawaiian style is about to be checked off. Bucket List III – The odds a Bucket List team wins have just gone up. 18. Bucket List IV – Spur of the Moment Underdogs – These are my friends and social network groups who RSVP’ed and want to paddle but tend to do everything at the last moment.. I would like to set this group aside and may be able to form a fourth team or fill holes in other teams. If I could use this as a underdog last minute entry that will change all the winning odds of the Saturday race. If they show up and pay, don’t count us out, but don’t count us officially in just yet. 19. Growing with Big Green – is a group of workers at Exeter Finance, we work in the IT department for the auto loan financing group in Las Colinas. It’s a group working hard building a young company into a large and profitable player in finance world. The company grew 400% last year after being subsidized by the Blackstone corporation. 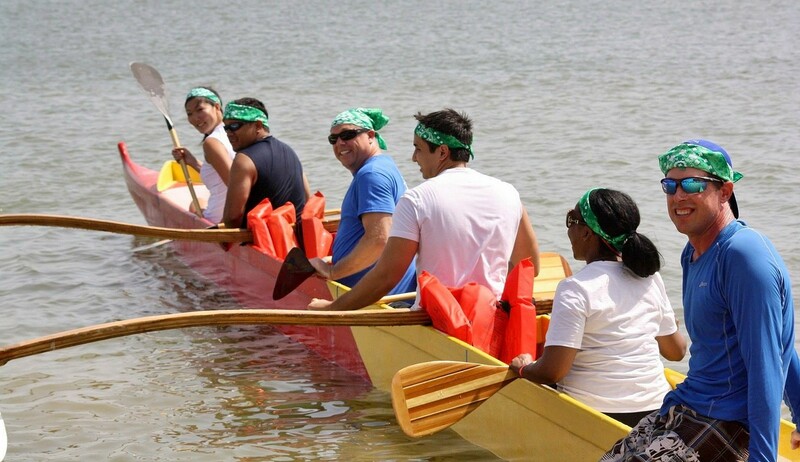 We are ready to transfer our explosive growth in the workplace right off the start of the Best Little Canoe Race in Texas. Co-workers from Partsmaster HQ in Irving, Texas, return for their second attempt to earn a team trophy. They’ve changed their 2012 team name (formerlyWind Breakers) and added a guitar player to their crew…a secret formula for victory? Maybe! Manu Birkmeyer’s crew includes Kimberly, Luigi, Shanna, and geetar-pickin’-first-time-paddler, Eddie. Also returning this year is Brian Springs’ GiftCard.com team. The ‘Rock’ in the Rock ‘N Rowers is their CIO, an experienced rower who inspired the team last year by calling their attention to the GEICO Rowing Guinea Pigs tv commercial! Crew paddler, Nina Rangel took advantage of scheduled CC crew practices this past Sunday…and enjoyed herself so much, she’s paddling again this Saturday and dragging her crewmate, Christine Best along with her. Y’all come too, last weekend practice for CC crews…make your reservations today! Perhaps this team will be sending sympathy cards to their competition? More info still to come. Team organizer, Beth Kochur’s Corporate Challenge crew is making their first appearance in outrigger racing. Their team name is a combination of 2 engineering companies, MWH and Bury. Crew mates Angela Matthews runs for fun & works at SaenzBury; Nicole works for MWH; and Jacob Neimeier works for GarzaBury. They’re still looking for a 5th male crew member. Although her crew has no previous paddling experience, Beth previously paddled with the Tri-Cities Outrigger Canoe Club in eastern Washington State. Bet Beth will pass some of her paddling wisdom on to her crewmates! Shea Reimenschneider’s Homecare Homebase crew are co-workers Shari, Janna, Tyler and Andrew. The entire crew are first-time paddlers looking forward to getting out on the big waters of Lake Ray Hubbard’s Wind Surf Bay. My kind of folks! Your kind of competitors! Christine Emmanuelli and her crew of Adela, Brazile, Fabian and Nathaniel are making their first Corporate Challenge appearance. This race will be her last outrigger race event in Texas…she and her 2 sons will be moving back home to Puerto Rico. Perhaps her going-away present will be one of the Corporate Challenge Trophies? Gustavo’s crew with Fernando, Austell, Katie and TBA fifth paddler will be competing against Mom, Christine’s crew above…and brother, Adrian’s crew below. Plus the 8 other crews! A family affair, or fight…is all fun! Adrian’s crew with Juan, Diana, Audry and Vanessa will be ready for brother, Mom and all the other competitors. Juan, Vanessa and Diana practiced this past Sunday. Practice might make a difference! They’re baaaaack!!! 2012’s Corporate Challenge Third Place Finisher, Lilo is back, but with a new team name & some different faces. Lawrence Escobido, Hudson Hyatt, Tracy Sauerpof, Joseph Banks, Erica Nunes and alternate LaVerne Nunes will be looking to improve their 2012 standings. This crew and the following two teams represent LaVerne Nunes’ Watauga Hula School’s 3-pronged strategy for paddling fun & competition! They’re signed up to practice on Sunday morning. The second prong of LaVerne’s hula attack are paddlers Diane Brown, Doug Brown, Scott Brown, Futi Willingham, Sita Roy and alternate, Bruddah. They’re scheduled to practice on Sunday morning too. An ‘opihi’ is a Hawaiian limpet–a gastropod with a low conical shell found on ocean & seaside rocks– a Hawaiian raw delicacy that’s great with beer! This ‘opihi’ crew of Nicole Nunes, Alicia Perez, Cody Perez, Junior Alvarado, Malakai Nisa and alternate Alexis Nunes might just sneak up on everyone…and the top honors. And this, LaVerne’s third racing element is also scheduled to practice on Sunday. Information on Chris Carrock’s crew still to come. If a geetar-pickin’ addition to a racing crew is some kind of formula for victory, then Kahiau Mahelona’s crew with Rachel and their friends/roomies Bert & Rayleigh could paddle home with a trophy All are chums from their elementary school days in the Colony…and all love playing guitar to one extent or another. Rounding out his crew is Stepmom & flight attendant Stacie, who flies the Friendly Skies of United Airlines. Just pickin’, paddlin’ & flyin’ high! Speaking of flying…one United Airlines flight attendant ain’t enough for this Corporate Challenge, we gotta have two! Hawai’i-born Carrie Lynn Asing (45) also flies for United, but on race day will command her own crew: brother Woody Asing (51), son Micah Paulo (21), nephews Chris (24) and Colton Asing (21). of them is to use their specialized skills to…Unclog & drain the lake! bequest Dead Last to another crew. Here comes the Asing ‘ohana!